On South Georgia we were fortunate enough with the weather to be able to study all of its major geologic units. After entering the heart of the Late Jurassic ophiolitic complex in Larsen Harbour, and making our way past somewhat unwelcoming fur seals in Cooper Bay to reach the Cooper Bay dislocation (a left-lateral strike-slip mylonitic zone perhaps associated with the first eastward displacement of South Georgia relative to South America) we turned our attention to the Cretaceous turbidites, which form most of the island. What better place to start than the huge overturned fold that guided Sir Ernest Shackleton and his men in the last stage of their epic journey from Elephant Island to the whaling station at Stromness? Nearing end of our “Shackleton walk” from Fortuna Bay to Stromness, we reached a ridge overlooking Stromness Bay and were treated to a fantastic view. Large tabular icebergs dominated the blue water of the bay, sparkling in the sunshine. Beyond them, on the point at the eastern entrance, was a huge fold overturned to our left, the northeast, and characterizing the dominant northeastern vergence of the Cumberland Bay turbidites. Below us lay the ruins of the Stromness whaling factory with our ship anchored offshore. We reached the beach by sliding down a long snowfield on our rear ends and walking down the braided stream below the waterfall Shackleton and his party descended perilously. Our slide was rather intimidating at first as the initial descent on the snowfield steepened to a steeper section out of view. However, judicious use of heels, elbows and trekking poles permitted a controlled journey to the talus slope at the bottom. The next day we entered at Godthul, “Good Harbour” to the Norwegian whalers. In the southwestern corner geologists of the British Antarctic Survey have mapped a thrust contact between the Cumberland Bay Formation and the other turbidite sequence of the island, the Sandebugten Formation. 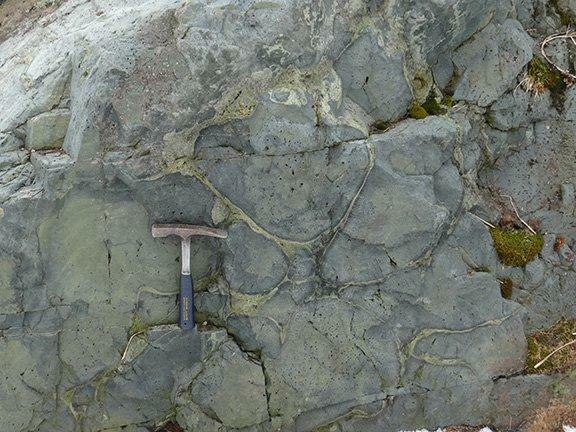 The Cumberland Bay Formation contains Aptian-Albian fossils and is composed dominantly of intermediate composition volcanic detritus. The Sandebugten is unfossiliferous and composed dominantly of siliceous detritus. The actual contact, though exposed at nearby Dartmouth Point, was obscured by old rock falls. We climbed up into the Sandebugten on the southern side of the bay and along Reindeer Valley to the west. The reindeer, introduced by the whalers for recreational hunting as well as fresh meat, crossed their valley ahead of us. We could see cliffs of the darker weathering Cumberland Bay strata on the hills to the north, and as we traversed a col above Sandebugten itself, an inlet on Cumberland East Bay. We found ourselves walking down a ramp on the Sandebugten seemingly with cliffs of Cumberland Bay above. Perhaps the map needs minor revision here, though the distinction between the slightly lighter colored Sandebugten rocks and the darker weathering Cumberland Bay is by no means always obvious. This is significant because it is the source of the Sandebugten that seems to be the critical clue to the origin of the South Georgia microcontinent. There is no source to the north for the siliceous detritus that make up the rocks. Hence the suggestion that the microcontinent was once situated immediately east of Cape Horn where there is a ‘hole’ in the continental margin and the ignimbritic Tobifera Formation could have provided a source. As we descended to Sandebugten we could see over to Dartmouth Point where my colleague Bob Dott and I, together with our then-graduate students Ron Bruhn and Bob Winn, first discovered the Cumberland Bay-Sandebugten contact in the early 1970’s. The following day, January 6, we visited broad St. Andrews Bay with its endless hordes of penguins, fur seals and elephant seals, finding beautifully exposed Sandebugten rocks in an old sea stack at the eastern side of the bay. The siliceous strata and interbedded black shales there are intensely deformed by two stages of deformation. We found this to be true also at Gold Harbour, our last stop on South Georgia located near the eastern end of the northeast coast. Here the Cumberland Bay-Sandebugten contact is mapped at the western end of the cliff s on the northern side of the bay, but we concluded that it was likely to be still farther west at a change in gradient of the topography, with the Sandebugten forming the low cliffs and the Cumberland Bay the higher ground. After our landing at Gold Harbour we set out across the Central Scotia Sea for the South Orkney Islands, which we ultimately bypassed due to ice. The Central Scotia Sea has proved enigmatic over the years because of its east-west trending supposedly Neogene seafloor spreading anomalies. My colleagues and I now believe that the anomalies are older, perhaps Early Cretaceous and are overlain by Neogene (ca. 30-12 Ma) volcanic constructs of a submerged remnant South Sandwich arc.